Nalanda, whose very name was evocative of its association with knowledge, exists as an acclaimed Buddhist pilgrimage destination in modern-day Bihar, India. Nalanda used to be a Buddhist ‘Mahavihara’, a term used in Buddhist circles for a great university. Archeological excavations in the region have revealed remnants of its monastic and scholastic past from third century BCE to thirteenth century CE. The most celebrated of the ancient universities to adorn the subcontinent, its continual functioning for more than 800 years can be interlinked with the development of Buddhism into a major religion, while its disintegration is concomitant with the decline of Buddhism in India. 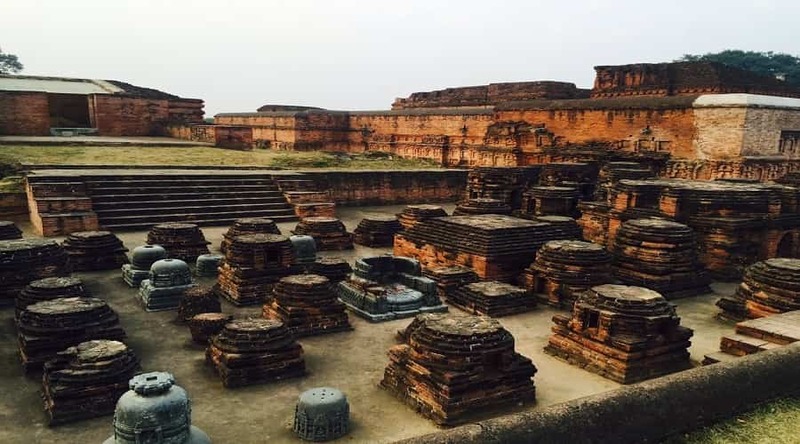 Nalanda, which began as a prosperous village along a trade route next to Magadha’s capital at modern day Rajgir, is conventionally associated with Buddha and Mahavira marking its existence around 5th-6th century BCE. In fact, Sri Buddha is said to have delivered lectures at Pavarika, a mango grove adjacent to Nalanda. While biographies of Mahavira, the twenty-fourth Jain Tirthankara, cite his having spent fourteen monsoon seasons at its soil. It is, however, to be noted that there are few archeological or other historical evidence supporting the claim. Sariputra, one of the chief disciples of Lord Buddha, is said to have born as well as attained enlightenment in this sacred soil. Ashoka is credited with building of a stupa in its terrain in the third century BCE. Luminaries of Mahayana Buddhism, one of the three major streams of Buddhism, like Nagarjuna and Aryadeva are said to have functioned at Nalanda University. This period -from its inception in the fifth century BCE till fifth century CE- marks its pre-glory era before the University came under the patronage of Gupta Empire. In fact, it is from here that the datable history of Nalanda begins. The fifth century CE Gupta emperor Shakraditya (probably Kumaragupta I) is identified as the founder of the Nalanda institution by travel accounts of Huien Tsang, Prajnyavarman etc. It must be under the Gupta Emperors that the Institution developed as a real university and Buddhist monastery, while the early accounts must be suggestive of its having served as learning and scholastic space. Gupta emperors known for their contribution to the flourishing of Nalanda University include Buddha Gupta, Baladitya, Vajra and Tathagata Gupta.. The many kings who contributed to the university’s development after Guptas continued adding on to its architectural framework. The most remarkable of the patrons of Nalanda University in the post-Gupta era was Harshavardhana. Much of what we know of Nalanda University are from the travel accounts of Huien Tsang, a Chinese scholar who travelled the breadth of India and studied in Nalanda University during the reign of Harshavardhana. His descriptions reveal the majesty of one of the finest educational institutions at its peak. Other trusted historical accounts include those left by Yijing, another Chinese pilgrim to have visited the premises a generation later. Nalanda’s status as an acclaimed centre of learning continued well into the twelfth century under the reign of Pala dynasty. With the raids conducted by Turkish invaders (Mamluk dynasty of Delhi Sultanate) in the early thirteenth century, Nalanda fell to ruins and could never recover to its formal glory. With time, the memories of this university were lost until archeological excavations of the nineteenth century brought them back to world’s consciousness. The rich array of sculptures, inscriptions, coins and seals recovered from its ruins are now kept at Nalanda Archaeological Museum. It is estimated that this glorious university housed over 10,000 students and 2,000 teachers at its peak. Also, Nalanda University is considered to be the first residential international university in the whole world. Pilgrim and travel accounts mention that the precincts of Nalanda University were enveloped by a high wall. Ten monasteries built in traditional Indian design have been excavated from Nalanda’s premises. The cells of the monasteries opened onto a common courtyard, while a main entrance lead one inside the courtyard. Also a shrine facing the main entrance was situated inside each courtyard. An array of larger stupas stood in front of the monasteries. This forms a template of the Mahavihara excavated from Nalanda. The treasure house of ancient relics excavated from Nalanda is kept on display at the museum in Nalanda. Their historical importance can be gauged from the fact that UNESCO declared them a World Heritage Site in 2016. Although the recovered area from Nalanda extends to a mere 12 hectares, the area to have been under the Mahavihara at Nalanda in medieval times is estimated to be much larger. One find’s such exquisite descriptions of the physical premises of Nalanda Mahavihara in the travel accounts of Chinese pilgrims. The most noteworthy of which includes a depiction of its library – three nine-storeyed buildings with millions of titles on myriads of subjects. That scholars and students from as far as Tibet, Korea, Central Asia and Korea sought out Nalanda University is a testimony to its days of former splendor. Mahayana Buddhism is one of the major branches of Buddhism which had its origin in Indian soil. As per this stream of Buddhist philosophy and dharma, the ultimate goal is the path of Bodhisattva wherein one becomes willing to remain in cycle of rebirths until all sentient beings are freed of suffering. This is contrasted with the more orthodox school of Buddhism- Theravada, as per which the goal is attainment of enlightenment and escape from the incessant cycles of birth, death and rebirth. British art historian and Indologist Vincent Smith is said to have stated that a comprehensive history of Nalanda would illumine one about the history Mahayana Buddhism as well. Such is the closely knit historical connection between Nalanda Mahavihara and Mahayana Buddhism. In fact, Tibetan Buddhism is said to have been derived from Nalanda Mahavihara’s lineage. With the decline of University in the thirteenth century, Nalanda’s last throne-holder is said to have fled to Tibet. The learning heritage of Nalanda was kept alive and later flourished in Tibetan soil. In fact, The Dalai Lama considers himself a successor of the seventeen Mahayana masters of Nalanda Mahavihara. Nalanda University Ruins: Visitors can explore the many ruins of Nalanda Mahavihara at a nominal price (Rs 15 for Indians and Rs 200 for international tourists). Go down the lanes of history of this glorious land. Nalanda Architectural Museum: You may witness some of the metal and stone statues that were unearthed during excavations at the air conditioned rooms of Nalanda Architectural Museum maintained by Architectural Society of India. Nalanda Multimedia Museum: A 20 minute movie depicting the history of Nalanda in 3 D Animation is shown here. Hiuen Tsang Memorial Hall: Built to commemorate the famous Chinese traveler Hiuen Tsang whose travel accounts have richly contributed to our understanding of India’s past, the hall is a joint undertaking by Indian and Chinese authorities. Surya Mandir: This temple adjacent to Nalanda University has statues dedicated to Sun God, Hindu as well as Buddhist deities. Chief highlight is the five feet tall statue of Maa Parvati. Rajgir: Pilgrimage centre of Hindus, Jains and Buddhists. Situated at a mere 12 km distance from Nalanda, major tourist attractions include Vishwa Shanti Stupa, Swarna Gufa and Griddhakuta Parvat. Bihar Sharif: Headquarters of Nalanda district. Situated at a mere 13 km distance from Nalanda Mahavihara, Bihar Sharif is the center of Islamic architecture. Chief highlights include Malik Ibrahim Bayans tomb and its many relics of Jain and Buddhist heritage. Bodh Gaya: The prime Buddhist pilgrimage destination. Situated at a distance of 50 km from Nalanda Mahavihara, its chief attractions include Maha Bodhi Temple, Bodhi Tree, archeological museum etc. By Air: Alight at Patna airport if you prefer travelling by air. It is an 89 km drive from Patna till Nalanda. By Rail: The nearest railway station is at Rajgir. It is a mere 12 km drive from Rajgir till Nalanda. By Road: Nalanda is well connected by road with all the major cities in Bihar, be it Patna (90 Km), Gaya (65 Km), Bihar Sharif (13 km), Rajgir (12 km) or Bodh Gaya (50 km).